The diameter of a network is the length (edges) of the longest path between any two nodes. Generally, the diameter is small, like 6 of small-world phenomenon, and it is independent of network size. The small-world effect imply the dynamics of processes taking place on networks. e.g. fast spread of information for the network, like rumor. This effect also underlies some well-known parlor games, particularly the calculation of Erdős number and Bacon Number. The degree of a node in a network is the number of links connected to that node. We can define a probability pk to be the fraction of nodes in the network that have degree k. Meanwhile, the pk could be considered as an uniform probability for choosing nodes with degree k at random. Plot pk (vertical axis) with degree k (horizontal axis) for some networks can form a histogram of degree distribution of nodes, as follows. It is observed that the degrees of nodes are highly right-skewed. 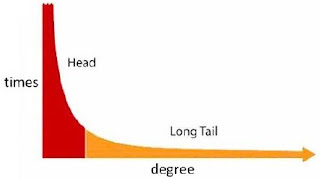 In other words, the distribution has a long right tail, or heavy-tailed distribution, it might be the well-known long tail effect. Alternatively, this distribution can be plotted in a logarithmic method, as follows. 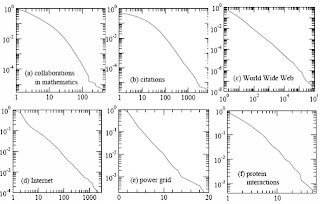 Marvellously, it is nearly conformed with Power law, which is the primary property of scale-free network. 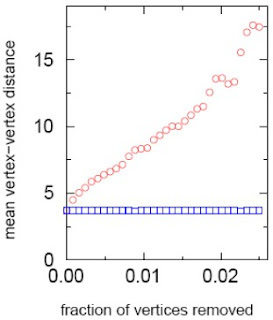 In contrast to the Poisson distribution of random graph (Erdős-Rényi model).